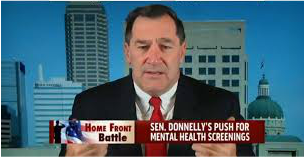 In May 2014, Senator Joe Donnelly proposed legislation to address what has become an epidemic of suicides within the military of the United States. The number of military personnel suicide deaths, by the year 2012, had already exceeded the total number of combat-related deaths in Afghanistan and the problem continues to grow. The oft repeated number of 22 military personnel suicides each and every day speaks tellingly to the scale and depth of the military suicide problem. The American electorate has grown accustomed to the style of their elected representatives triumphing their ability to contribute favorably to the governance of this great country. What our elected representatives contribute, all too often, is not substance, but a constant flow of opportunistic lip-service, which far overshadows the integrity of their discourse. Our representatives have become constant campaigners. Donnelly, like so many of his colleagues in the Senate and Congress generally, never passes upon an opportunity to parade and praise our men and women in uniform, our troops. These are the same troops whose families and friends bought body armor for them, because the availability of personal armor for our troops was wholly inadequate when they were dispatched to Afghanistan after the horrors of 9/11. And, as the causalities from that campaign began to mount, veteran healthcare services in the United States to treat our defenders of the American way of life proved inadequate, and shamefully so. The military services mental health legislation proposed by Donnelly et. al., was attached to the 2015 National Defense Authorization Act. The legislation suggests that provision be made for every member of our Armed Services to have a person-to-person mental health assessment each year, while at the same time, the bill contains language designed to protect the privacy rights of those members of the military who voluntarily seek mental health assistance. It is noteworthy that a National Defense Authorization Act has been passed by successive Congresses for over half a century. In relation to the proposed Military Services Mental Health legislation, Senator Donnelly noted that the well-being of our volunteer fighting force, those who stand at the ready to deploy and, if and when necessary, engage the enemies of the United States is of national concern. He also suggested that we enjoy liberties granted to us by the sacrifice of the men and women who have worn the uniform of the United States Military. Whereas in true campaign style, this statement might bring cheering admirers to their feet, it ignores the fact that in the American experience, our liberties were Endowed by our Creator and codified into the Constitution of the United States. If, Donnelly and the Congress generally, actually believe that the mental health crisis within our military is a matter of national emergency, pro aris et focis, that is to say, a state of affairs, a threat against the ability of the United States to defend itself against all foe - where no expense or endeavor can be too great, because all we have is at stake, and consequently, our utmost force is to be exerted against that threat. Then, it makes no sense whatsoever, to propose and pass a piece of legislation to address that threat, which provides not one scintilla of financial or any other material resources to address the problem. It is a bridge to nowhere. In fact and in law, with the passage of this unfunded legislation, those agencies which currently bear the responsibility to care for our military causalities and their families are placed in the unenviable position of having to steal from Peter to provide services to Paul, as it were. This is not what Lincoln had in mind when he suggested that we ought to care for him who shall have borne the battle and for his widow and his orphan. There are campaigns where such treachery of action is permissible, actually. An army, for example survives by treachery, such that, the army should appear incompetent when it is competent, appear to be advancing when it is in fact retreating, appear to be retreating when it is advancing and, appear to be unprepared to fight when it is prepared to fight. In a phrase, it is essential to deceive the enemy with false impressions. But, it is not proper to use treachery of action and purpose, Senator Donnelly, in relation to our own men and women who have answered to call to serve the United States of America in uniform, Our troops.